TriMet wants to hear from you! We will be holding seven open houses this November to discuss exciting proposals for the years ahead, including new bus lines and 24-hour service on some bus lines. This is a continuation of TriMet’s 10-year expansion of transit service. We are inviting the public to join us at an open house to provide feedback on proposals and learn about upcoming projects, including a low-income fare program and an all-electric bus test. People also can provide feedback online at trimet.org/plan, by sending an email to comments@trimet.org or by calling 503-238-RIDE (7433). See list of open houses below. To better serve the needs of our riders, we want to add a new bus line running between Clackamas Town Center and Oregon City Transit Center. We also want to introduce a brand new bus line to Portland International Airport that will compliment MAX Red Line service. Line 4-Division/Fessenden is one of our longest and busiest routes. Splitting it into two routes will help keep buses on time and accommodate rider demand. One route would run between Gresham Transit Center and Downtown Portland. The other would run between Downtown Portland and St. Johns. Both routes would serve stops on the Transit Mall along 5th and 6th avenues in Downtown Portland to allow for easy transfers. It’s been more than 30 years since TriMet last provided our riders with all-night service. We’re considering running buses 24 hours a day on Line 20-Burnside/Stark, Line 57-TV Hwy/Forest Grove and the proposed new line to Portland International Airport. The community spoke up and we listened. We are proposing changes to Line 24, which runs from N Vancouver and Stanton to Gateway Transit Center. This includes a new section along 18th and 19th avenues between NW Thurman and SW Jefferson streets, increasing frequency during the week and adding weekend service. Learn more about our bus service improvements here. And many more efforts to make our transit service better and more reliable. 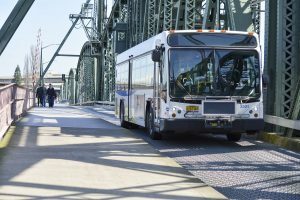 TriMet provides bus, light rail, commuter rail and paratransit services across a 533-square-mile district, connecting communities while easing traffic congestion and reducing pollution.